Sweet 'n Sassy Stamps is celebrating their new stamp release today with a fun blog hop, and I have some designs in the mix! So excited to finally share them with you here. 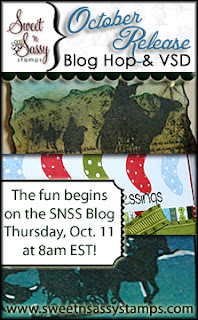 If you just happened on the blog hop because you're a regular reader of my blog, and you'd like to view the entire hop, you can start back at the Sweet 'n Sassy Blog - you'll find a full list of participants there, and all the details you need. If you're already hopping and you arrived here from Bridget's blog you're doing just fine. Be sure not to miss a single stop along the way because we'll be drawing one lucky commenter from a random DT blog to win a $25 credit to the store!! I decided on a clean and simple (CAS) layout for my card, and kept color to a minimum. The collage image is stamped in Brilliance Lightning Black ink, which is a beautiful black and gold mix. I used a stipple brush to apply chalk ink to the image, masking off each area at a time to create the appearance of rays coming from the star. I also used the Grunge Borders diamond stamp to create some interest in the background. The edges of the main panel are painted with gold acrylic paint by Lumiere. Here's a different angle on the image so you can see the shimmer of the Brilliance ink and gold paint! Shiny! We'd love for you to come celebrate the new release with us over at the SNSS forum at Splitcoaststampers! There will be challenges posted throughout the day. And prizes! After you leave a comment here you'll be hopping on to Gloria's blog! She is our guest designer this month. Hope you are enjoying the hop! 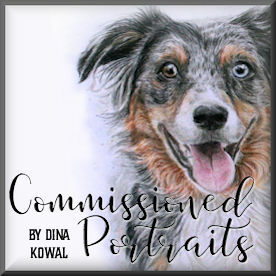 Absolutely stunning, Dina! 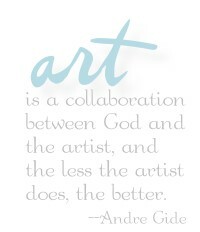 I love the CAS quality and your use of color...I know white space makes you twitchy, but my goodness you use it well!!! Your shining light is a perfect touch!! Beautiful new set Dina and love the colors on your card! I love how you did the rays from the star! Too awesome. I love this beautiful new set and the sponging you did here makes it look regal, Dina! 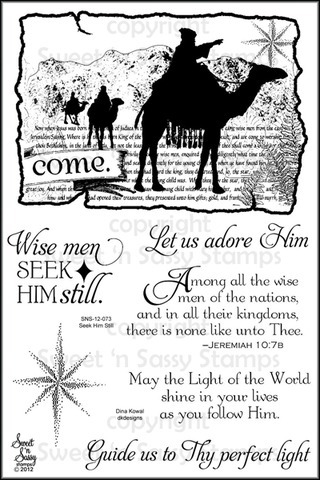 Love how the wise men are bathed in rays of light! Gorgeous! What a fantastic set - love all the sentiments especially! Very pretty.I really like this stamp set. The wise men image and all the sentiments are great. Very nice card. Great purple color!! Stunning card! The color on this just pops! LOVE this set and what you did with it on your card. Lovely. Just gorgeous. I love that you used just the word 'come' as the sentiment, and the gold star is wonderful. Great work! I love the color choices and that you kept it simple! Beautiful choice of color & technique, thanks so much for sharing it. I love how you used purple for this card. It is just so cool. And I love, love this set you designed. Can't wait to get it and start making some Christmas cards with it. Lovely--I like how you colored the image. I never would have thought to use these colors for a Christmas card, but they look fantastic, especially with those trendy diamonds in the background! NJ! Gorgeous! I just love this stamp set! Gorgeous card! Love the diamonds in the background! Oh wow this is so stunning Dina!! Love your color design!! Thanks for the fun blog hop! HUGS! What a lovely card Dina. The colors are fabulous! Great design. Dina, how awesome that you made the stamped image the truce focal point with just a little gold shimmer. Beautiful! Wow! What a beautiful card! Love the texture and colors! Such a gorgeous card! I LOVE how you created the rays of the star! And the white base really makes the image the "star" of the show. Lovely cards, thanks for sharing!